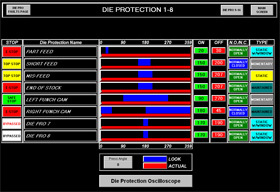 Die Protection is used to protect your die in the case of an unexpected event. These events can include misfeed, short feed, long feed, buckle detect & part eject. Toledo Integrated Systems offers a stand-alone die protection system (B500 Modules) and is included in many of our all-in-one packages such as the Maximizer. Below you can browse through our stand-alone and all-in-one packages which have die protection features included. The Maximizer is a fully integrated press automation and control system. The PLC-based packages allow for customization and expandability. Create the system that fits your needs now, then enhance and expand as your needs change. We can custom tailor each maximizer for your needs or integrated with an existing PLC system including Allen-Bradley, Siemens, Mitsubishi, and many more. The Press Attendant is a press automation and monitoring package. It combines tonnage monitoring, die protection, programmable limit switches, brake monitoring, motion detection and more into one encoder based system. The Toledo DPPlus unit is a basic press automation system that integrates die protection, programmable limit switches, brake monitoring and job storage into an encoder based package. The universal sensor interface allows for multiple uses, including die protection and production monitoring. This interface box can be altered to fit existing sensors already in place or be customized for any sensor with npn or pnp open collector outputs. These sensors were designed to allow maximum flexibility and to be compatible with most control units in the industry. They are also easy to install and inexpensive to own. The standard sensor interface allows for up to eight (8) NPN inputs. This interface box comes standard with eight (8) banana plugs (both male and female included). If the die protection package that you are looking for is not listed above, try using our Google search featured located near the top of the page. You can also contact us directly at 1-800-TTOLEDO or sales@ttoledo.com.